As I mentioned earlier this month, John and I have been renovating our upstairs bathroom. It’s been entirely gutted and we are basically starting fresh. John’s ripped out the walls and put insulation in them. Can you believe there was no insulation?! He’s also added in a 6 foot bathtub, new tile backsplash and a new sleek showerhead. We are about half way there and he still has to install the sink and vanity, toilet, flooring and then I can paint and add in the decorative touches. It’s going to be absolutely beautiful when its done. It will be my relaxing oasis and I cannot wait. There are easy ways you can upgrade your bathroom without having to start from scratch like I’m doing. I already shared with you how big of a difference upgrading your bathroom with tile makes. Today I want to talk about upgrading your showerhead for a whole new and improved experience! It doesn’t have to cost you a fortune and it’s something you can do yourself. A few months ago, John and I went shopping at The Home Depot to pick out our plumbing for the bathroom. One important item on our list of things to buy was a showerhead. I was impressed with the selection at the store. Who knew there are so many different types of showerheads on the market? I was most interested in purchasing a rain showerhead. We stayed at Caesar’s Palace last year in Las Vegas and our hotel room had a rain showerhead. I swear it was the best shower I have ever had. It was so relaxing and felt so good. I had a hard time leaving because I knew I’d miss those showers! We settled on the DELTA Lahara Monitor 14 Series Tub And Shower With In2Ition Two-In-One Shower. I picked this particular one for its elegant design, but more importantly because it had the In2ition Shower System! It has a detachable hand shower that runs simultaneously with the showerhead so you have two streams of water going at the same time. The description sounded just heavenly and it was recommended to us by the associate at The Home Depot who was helping us with our purchase. Type of showerhead: Think about what kind of experience you want. Do you prefer a soft, gentle rain or a pounding rainstorm? You’ll find that there’s something for everyone no matter what your preference. Look at the spray options, massage settings and the water pressure each showerhead offers. 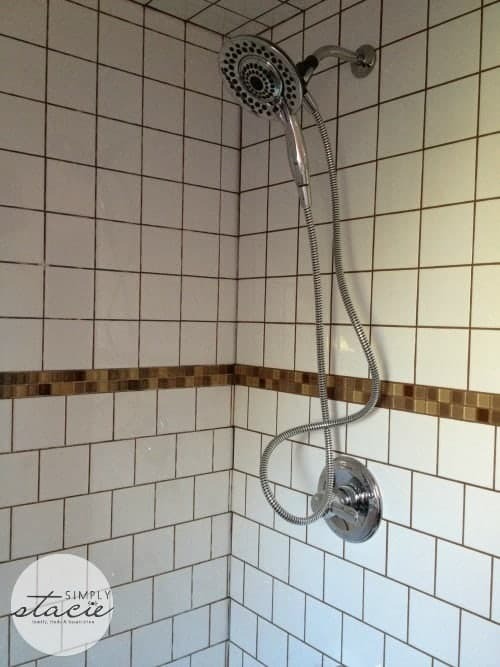 Handheld or Fixed: Do you like a more traditional showerhead where it’s fixed directly onto the wall or would you rather a handheld one you can maneuver? I personally like the handheld version better because it comes in handy when you’re cleaning the tub! Budget: Showerheads vary widely in price so know ahead of time what you want to spend when you go to the store (or look online) and see what options are available in that price range. The nice thing is that you don’t have to break the bank to get a good quality showerhead. Rain showerheads are all the rage nowadays and are available in different sizes and styles. They offer a soft, gentle rain-like experience and often include a variety of massage settings. The Home Depot has a couple of rain showerheads that look like they would be simply divine: KOHLER 10 Inch Traditional Round Rainhead With Katalyst Spray Technology and the KOHLER 14 Contemporary Round Rain Showerhead. I encourage you to check out the DIY Workshops offered at The Home Depot. Their section on Baths will get those ideas flowing on ways to improve your bathroom! Connect with The Home Depot on Facebook, Twitter and Pinterest. Have you entered my giveaway for a $500 gift card to The Home Depot and a consultation with a local associate about renovating a bathroom? It’s going on now till November 1st and is open to Canada only (excludes Quebec). I’ve been sharing all the entries on a Pinterest board. Lots of people would love some help improving their bathroom! We upgraded to a rain head shower head in our master bath and now I am itching to change out all the standard builder shower heads in the house – the one you chose would be perfect for the boys bathroom! All three of our bathrooms are in serious need of remodeling. Yuck. but I am in love with that shower head! I love that it can also have a hand held feature, or a much larger spraying surface if you want. This looks a lot like the shower head I recently used while at a hotel and it was FANTASTIC. I love that Home Depot gives you all the help you need to DIY. That showerhead looks fantastic. I love that it has the hand held part AND still a regular shower head, you’d keep a lot warmer that way! Now I want one too! Sounds like a great way to get a jumpstart on remodeling. Wish I was in Canada so I could enter, and get away from all the crazy that is happening here in America. Good luck to those who enter. oh I like that, looks like you get full coverage!!!! Oh I want that shower head! Ours is so weak now so I really do need to upgrade! Thank you! Our current showerhead is HORRIBLE. We need a nice new one so bad. Love that showerhead! We just bought a new one so have to use it for awhile before I can justify buying a new one but I do wish I had bought one like this. I would love to have a shower head like this! We’ve just installed a rain water shower head and we love it! Your bathroom sounds amazing! i am very jealous. i would love a rain showerhead. i would also love to renovate my bathroom..it is so plain and boring. This is a really nice showerhead and looks way nicer than the one I have. That is terrible that you had no insulation in your bathroom. That is not a place that you want to not have insulation. I like this showerhead so much that I want a new one just like it! It’s amazing what a difference little changes can make! We replaced our sink faucet with something a bit more stylish, and I think it’s like a new room. We have upgraded to a rain shower head as well, they are awesome! Yes the showerhead makes a big difference. We replaced our 15 year old ones and got a harder spray and it said it conserves water. Hoping to redo entire bathroom next year. Glad to see your project is going so well. I have the EXACT same shower-head!!!!! I love it; especially the ability to switch between a gentle rain-fall pulse versus the power massage pulse. Our bathrooms also need serious makeovers and who knew a new shower head can do so much! Love this idea. I’m so fed up with my current shower but I can’t just rip the whole thing out at this point, so maybe a new showerhead would help keep me sane for a little longer! Hey, that’s our showerhead!!! This is really the easiest way to make a big difference! That looks awesome. There’s nothing like standing under an awesome showerhead with the hot water massaging your back. It’s amazing what a difference a new shower head can make. I love this one! A new shower head can make ALL the difference! In one of our homes, we had a similiar one and it was soooo fabulous!!! Enjoy it! That shower head from the Home Depot is so amazing.It sounds like more fun than singing in the rain.Seriously I would love to win it and I am now dreaming of winning it! I’ve heard the DIY Workshops were good, but haven’t had a chance to go and check one out. This post reminds me that I need to think about getting a new shower head too. I would like to have a rain shower head. Wow! That showerhead looks like a UFO lol! I’m sure it is heavenly! Great idea. I’m going to check out Lowes. We have the worst shower ever!